Bjarke Ingels' firm BIG is set to build a sports and music venue in Austin, Texas, with a domed chequerboard roof and an area for rodeo at its centre. The 121,000-square-metre East Austin District will include a 15,000-seat arena that will host the Austin Rodeo, hockey games and concerts and a 40,000-seat stadium for football, rugby and matches, as well as music festivals. The venue will be the city's first permanent stadium for professional sports matches and large-scale music events. These will be accompanied by areas for retail, shopping and dining, and 28,000 square feet (2,600 square metres) of youth facilities. Taking cues from Austin's culture of socialising outside, Ingels' international firm BIG intends to break up the complex with eight courtyards. From above, the alternating indoor and outdoor spaces will form a grid, which the studio likens to a chequerboard. The roofs covering indoor areas will overlap at the corners and be slightly curved. They will start low to the ground at the perimeter and rise to the peak of the dome at the centre. Ingels describes the shape as a "submerged sphere" on his Instagram. 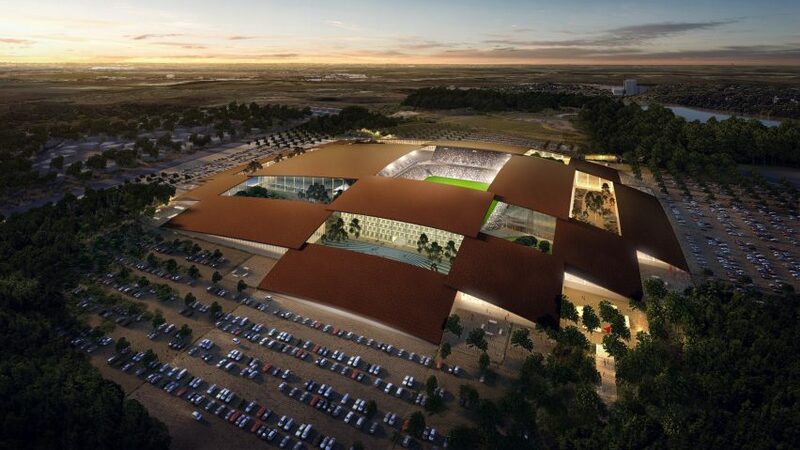 "Like a collective campus rather than a monolithic stadium the East Austin District unifies all the elements of rodeo and soccer into a village of courtyards and canopies," said the architect. "Part architecture, part urbanism, part landscape – the East Austin District is the architectural manifestation of collective intimacy – a complex capable of making tens of thousands of fans come together and enjoy the best Austin has to offer inside and between its buildings," he added. Red photovoltaic panels will cover each of the roofs, which BIG hopes will one day provide enough energy to power the surrounding East Austin community. In newly released renderings of the East Austin District, the outdoor areas are shown to be planted with cactus and trees. One is landscaped as a public plaza, including water fountains and tiered seating. Indoor areas are shown lined with wood to bring continuity between all the different elements. Ingels founded his eponymous firm in Copenhagen. He later opened an office in New York, to expand BIG's work in the US. The firm is also developing a new stadium design for American football team the Washington Redskins, which could also offer abseiling, surfing and kayaking. Its other projects in the US include a kindergarten in New York for co-working company WeWork, and a proposal for tackling climate change in the San Francisco Bay Area.